Farag joined Apple in 1999 to start work on what would eventually replace the "hockey puck" style mouse that came alongside the first iMac. The result was Apple's first no-button mouse design. Farag recalls a prototype presentation meeting with Jobs where he and the design team presented possibilities for what would be the next Apple mouse. The team had several versions to show Steve, some of which "were fully done, with all the parting lines cut in for buttons and different plastic parts, and all the colors just right," according to Farag. 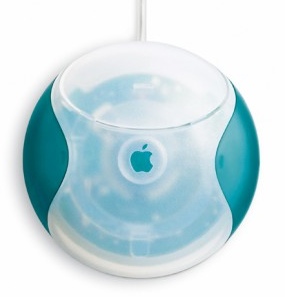 At the last moment the team decided to include a prototype that echoed the look of the previous gen Apple mouse, but it was not finished and didn't include cut-outs for the buttons. “We were going to put that model into a box so people wouldn’t see it.” Farag said. Jobs darted right for the unfinished one saying, “That’s genius…We don’t want to have any buttons,” according to Farag. As one would expect, someone from the design team quickly jumped up and agreed with Jobs as if that was one of the options all along. Now the team actually had to figure out how to make that happen. As you know, they succeeded with the no button design and it later shipped as the Apple Pro Mouse. It was the first Apple mouse with the "no-button" design and was the first mouse from the company to feature solid-state tracking as opposed to a track ball. Farag believes that while there were likely other company's with this kind of tech in development, Apple was the first to bring it to market. While the Pro mouse was considered a success for Farag and the design team, they were ready to take it to the next level, a level that contained multiple buttons. Farag explains that Steve was a believer that UI designers would learn how to make the system simple and clean enough that a user would never need more than one button. Early on in the multi button development, it was nearly impossible to convince Mr. Jobs that this was the way to go. One day at a protoype presentation for the new multi button mouse design, Jobs happen to pass by the room and wasn't happy about what he saw. “What morons have you working on this project?” Jobs asked the team according to Farag. In response Jobs said, “I’m Marketing…It’s a marketing team of one. And we’re not doing that product.” As he walked out of the room the project went out the window and no one spoke about multi button mouse design for nearly a year internally. Eventually Jobs changed his mind, but it wasn't until the design team came up with a multi mouse design that was so original it caught the late visionary's interest. The team made major innovations with a capacitive touch set up that would simulate having three buttons but still allow for the clean and minimalist design aesthetic that has become synonymous with the company. Later the company ditched the scroll ball on the Mighty Mouse because it allowed for dust to enter the device (among other reasons) in favor of the current iOS/track pad style Magic Mouse. Abraham Farag left Apple in 2005, and is currently operating a successful product consultant firm called Sparkfactor Design.